In recent months, we have taken an in-depth look at the structure and properties of cationic and nonionic surfactants. Another interesting category of surfactants used in both hair and skin care are the zwitterionic ones, those that naturally have two charges on the molecule, both positive and negative. These are attractive to the formulator due to their tendency to boost effects of other surfactants in the solution, as well as an ability to ameliorate undesirable properties of some surfactants, such as skin irritation and a tendency to strip the hair and skin of too much moisture. One familiar surfactant of this type is cocamidopropyl betaine, which is appreciated by many curly-haired consumers for its gentle, yet effective, cleansing capabilities. Zwitterionic surfactants (also: amphoteric surfactants) are characterized by having two distinct and opposite charges on the molecule at either adjacent or non-adjacent sites. The presence of both a positive and negative charge renders the molecule overall neutrally-charged at neutral pH. Some types of zwitterions are susceptible to pH changes in a solution and may become completely cationic or anionic in acidic or basic environments. The positively-charged site is typically a quaternized ammonium ion, but can also be a phosphonium ion, while the negatively-charged site can be one of a variety of anionic groups, such as sulfate, carboxylate, or sulfonate. 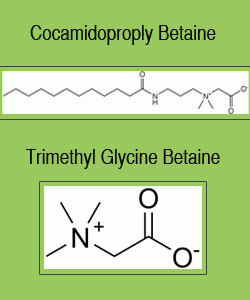 There are several common categories of zwitterions used in hair care formulations, such as the betaines and amphoacetates. In general, amphoteric surfactants have been found to be compatible with other surfactants and polymers, including silicones. The formation of self-assembling complexes between amphoteric surfactants and polymers or anionic surfactants has been observed and found to impart interesting properties to solutions containing these molecules. Amphoteric surfactants reduce static in hair by decreasing its surface charge density. Since the interactions between hair and zwitterionic surfactants are primarily physical rather than ionic, they are easily rinsed and removed from the surface of the hair. They have been found to minimize skin and eye irritation common to other surfactants, especially sulfates. They also can boost the foaming performance of anionic surfactant systems via a variety of mechanisms, by either increasing the speed at which foam is formed (flashing), improving the density and luxurious feel of the foam, or by increasing the foam stability (longevity). The betaine family of zwitterions possesses the positive-negative head group structure of trimethyl glycine (betaine), an amino acid derived from sugar beets. The hydrophobic tail group can be a straight chain alkyl group (such as in coco betaine), or can contain an amido group, such as cocamidopropyl betaine. Other betaines include lauramidopropyl betaine, oleamidopropyl betaine, ricinoleamidopropyl betaine, cetyl betaine and dimer dilinoleamidopropyl betaine. Additional variants are sulfobetaines, hydroxysulfobetaines and sultaines. Betaines are more resistant to thickening via addition of salts than their anionic cousins. For this reason, in order to achieve a pleasingly thick product, addition of viscosity-boosting polymeric additives may be necessary, which can increase the cost and complexity of the formula. Cocamidopropyl betaine is particularly valued for being an excellent cosurfactant for sodium lauryl sulfate, but it is also a gentle cleanser in its own right. Studies have found that it removes silicones from hair very effectively, without drying out the hair. It has also been shown to improve the solubility of sodium cocoyl isethionate, an extremely gentle, creamy and emollient surfactant. The combination of these two has the potential to create an extremely gentle and moisturizing shampoo. Betaines are more resistant to thickening via addition of salts than their anionic cousins. For this reason, in order to achieve a pleasingly thick product, addition of viscosity-boosting polymeric additives may be necessary, which can increase the cost and complexity of the formula. The specific betaine selected can have a significant impact upon the viscosity, foaming behavior and detergency of the final product. In order to choose the best betaine for her purpose, the formulator must be familiar with the properties of each of her options and how each interacts with the other ingredients in her formula. She will generally have a goal in mind regarding the physical properties, cleansing strength and cost of her formula and all of those will factor into the decision. Fortunately, for consumers, the primary concern is how the product feels on the hair and how the hair behaves afterward and the differences should not be tremendous between the various betaines. Currently, cocamidopropyl betaine is the one most often seen on labels and in the proper formulation, and is quite gentle to hair and skin. Other families of zwitterions are also used in formulations. They are becoming more common as their interesting properties are explored and as companies continue working to develop non-sulfate-based cleansing platforms. Some familiar ones might be the imidazoline derivatives alkylamphoacetates such as disodium lauramphoacetate, as well as alkylamphopropionates. These materials share many of the beneficial and gentle properties of the betaine family. Overall, zwitterions are an interesting class of surfactants with the potential for more growth in application, especially for curly hair, which needs a more gentle approach to cleansing. In recent years, there has been a growing demand for sulfate-free and gentler shampoos and cleansing products, especially in the curly-haired population, as we have learned the damage that can be done by harsh surfactants. As formulators continue to respond to the push from consumers for alternatives to sulfate-based cleansing systems, we can expect to see a growing number of products relying upon the milder cleansing properties of zwitterionic surfactants. They are less likely to strip curly hair of its much-needed moisture and can impart a silky feel to hair when used with other ingredients. A patent search reveals that scientists are working to develop more polymer-zwitterion systems, which should also eventually benefit the end product user by providing performance-enhancing properties. In this demand-driven market, the power consumers have to drive the research and development of new products is quite remarkable and should not be underestimated. Communities such as naturallycurly.com have a voice! So what do you think?